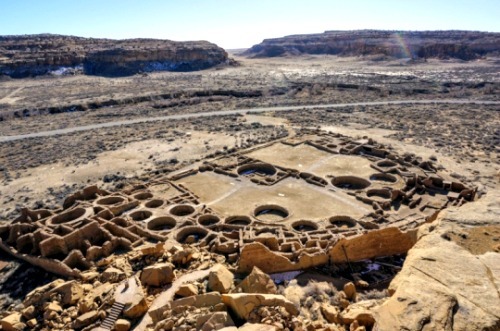 Chaco Canyon has a very long history, starting right back as far as 10,000 BC when the first hunter-gatherers came to the area. There have been more than 70 camp sites found in the area with items dating between 1500 BC and 7000 BC. When the main settlement pictured above was built is thought to be anywhere between 900 AD and 1150 AD as the area was known as being a major cultural centre for the Pueblo people at that time. The site itself was an impressive architectural achievement, as much of the stone and timber was brought in from great distances, and the settlement's 15 complexes remained the largest buildings in north America right up until the 19th century. Exactly when the settlement was abandoned is unclear, but it is thought to be soon after the year 1150, as a 50 year draught began in 1130 making life very difficult for the many people who lived here. The first documented mention of the site was by a New Mexico governor named Jose Antonio Vizcarra, who noted there were several large ruins in the canyon, including that of Chaco itself. Today the area is a UNESCO world heritage site and is open to the public for most of the year. I bet you can't guess the kind of spirits thought to haunt this place, taking into consideration the ancient Indian burial sites and underground ritual chambers, that's right, its haunted by the ghost of a giant hamster. But seriously now, the spirits of Indian's and their activity have been witnessed in the area one to many times to be dismissed as just another "camp fire stories" location. The settlement was the main site for all of the cultural going's on for the Pueblo tribe in the area, meaning religious activities, such as the ceremonies which happened in the circular underground ritual rooms where strange practices and sacrifices would have been made. All of this religious activity seems to have left its mark on the settlement, and though it was abandoned long ago, there are several remaining tribes in America today that do not consider it so. They believe that it is still inhabited by the spirits of their ancestors and have taken action against preservation organizations who have excavated parts of the site, claiming instead it should be allowed to return to the earth along with the spirits who still live there. As for spirits, the most common of which seems to be the apparition of a tall, naked man who has been seen emerging from the sacred holes in the middle of the circular ritual pits. There is even a story about how one of the park rangers tried to approach the man to arrest him for indecent exposure only to see him fade away into nothing when he got close. EVP has also been captured in the canyon by many campers who come to stay just outside the settlements grounds. The interesting thing about this EVP is that it is always in the ancient Anasazi languages which would have been spoken here, including Tewa, Keresan, Zuni, Tiwa and Hopi.